Does your child often perceive himself as being right when he’s wrong and wrong when he’s right? Some children have a hard time picking up on other people’s expressions, body language or social cues. These kids are often prone to thinking they’re being disapproved of or disliked when they’re not. Understand that reading social situations is a skill many kids with behavioral problems lack. Most kids acquire this skill as they grow: they learn to be more careful in situations where they might get in trouble or be hurt. Here’s an example of a child who is having problems learning this skill: let’s say that your child is in school and he gets out of his seat, even though it’s time for everybody to sit down. The teacher corrects him and tells him to sit down. Most kids have already taken their seats—they’ve learned to read that situation successfully. But when the teacher tells your child to sit down a second time, it triggers anxiety or frustration, which leads to increased behavioral control problems—and a diminished ability to see what’s actually going on. This cycle keeps repeating itself until your child develops a pattern of acting out around his inability to read certain social situations. Kids learn to get a majority of the information about their current social situation by reading people’s facial expressions and body language. This starts when they are infants and continues well on into adulthood. In one study, it was determined that more than 70 percent of a child’s perceptions comes from the looks they see on other people’s faces. Problems emerge for kids who have diagnosed or undiagnosed learning disabilities or behavioral problems that interfere with their developing the ability to accurately read social situations. These kids simply don’t develop the skills to read social situations in the same way that other kids do. And the misreading of these cues becomes one of the triggers for a lot of the behavioral problems that you see later on. That’s because they’re not getting the same information that the other kids are receiving. Don’t forget, a learning disability is an immature or malfunctioning part of a child’s neurological system. So the same data goes in, but the same solution—or behavior—does not come out. For kids who have a hard time reading social situations and who tend to act or behave inappropriately, it’s vital that you work on it with them as a parent. If your child lacks these social skills, the good news is that this problem can be fixed. For younger kids and pre-teens I recommend that you look at pictures of people online with your child. As they look at pictures, ask them to tell you what each person is feeling or thinking by the look on their face. Teach your child what different looks mean: happy, confused, angry. Practice with them—and when I say practice, I mean repetition and rehearsal. These things have to be ingrained in kids by practicing it as much as possible because that is the most effective way for them to learn. For older kids, remember that your child’s willingness to do this exercise is key. If they’re not willing to do this with you, then forget about it. If they are, sit down with them and look at pictures of teenagers and adults. Have them make up stories about certain faces: show them a picture and ask them to tell you a one-paragraph story about the person. You can also watch a movie together and talk about the characters’ emotions. You can try using a reward in order to get them to work with you on this. By the way, I’m pretty frank with adolescents when it comes to their inability to read social situations. They don’t like that because they don’t want you to notice any deficit in their personality at all. The key is to associate your comments with something observable and realistic. For most kids, it’s a huge relief. And then you role play it with them. You definitely, definitely have to role play—and role model—appropriately with these kids. For older kids and teens you can do role plays too. As a therapist, I would have them walk into my office four or five times in a row. Just go out and walk right back in. Here’s how to enter a classroom and sit down without aggravating the teacher and getting in trouble. They’d walk in and I’d say, “Hey, Charlie, how’s it going?” And if they responded inappropriately to me, I’d say, “Wrong. Go back out.” They’d try again and I’d say, “Hey Charlie, how’s it going?” All they needed to do was wave and sit down. Trying to change everything at once is overwhelming for all kids. That’s why I recommend that parents use “discrete learning.” That means you break down whatever you’re working on into individual little pieces. Limit it to one skill or one situation at a time. Be sure to point out the results later. Always tell kids when what they are doing is working. It gives them an incentive to keep trying, just like it does with adults. And then role-play how they can make that happen. Connect the new behavior to real things in your child’s life. But again, do it discretely. One thing at a time, one person at a time, one situation at a time, one class at a time. Social skills are one of the areas where the teaching and coaching roles become very important for parents. Remember, when you take on the teaching role, what you’re really doing is helping your child to learn new skills. “Self-talk” is how we talk to ourselves all day long. It’s the key to understanding so many behaviors, and the difference between thinking, “I can do this, it will be OK” versus “I’m stupid, they all hate me.” Kids can easily take something the wrong way, and then they start talking to themselves about it. In the end, they might end up feeling like they can’t make anybody happy. So it’s very important for kids to learn how to check things out at home, especially if they have parents who are hard to read. And that’s certainly also true with teachers and other significant people in their lives. Although I think kids should learn how to deal with bullies and kids who pick on them, I also think it’s the school’s responsibility to protect kids while they’re in school. 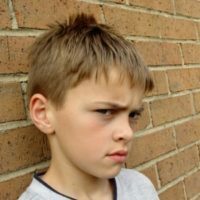 The techniques I’m sharing with you in this article are ways to help your child cope, but that does not relieve the school of the responsibility to make sure everybody is safe. As a parent, if your child is being bullied, do not hesitate to call the school. And if your child has been physically harmed, do not hesitate to call the police. If there are unavoidable places your child has to go during the day, like the bathroom or locker room, tell them to get in and out as quickly as they can. Kids also need to learn positive self-talk. They need to be able to say, “This is not my problem. This is the bully’s problem.” And they need to be able to ask for help. I firmly believe that if your child has a problem with reading social situations and social cues, it’s a very solvable problem. In my mind, repetition and rehearsal are the keys. How do you deal with the problem of not writing well? You practice writing. Remember, if your child is behaving inappropriately, whether it’s a result of a missed social cue or not, you still have to hold him accountable, as well as teach the new skill. Once your child knows how they’re expected to behave, you have to make him responsible for his behavior. And if you can’t hold him responsible, his chances of fully learning the new skill go way down. If you don’t hold your child accountable, he won’t have any reason to change. After all, you’re asking him to do something different, and “different” is usually perceived as “difficult.” People don’t like to change, so you have to stay on top of it and make sure your child is putting his learning into practice. The best reward for your child is that he will start to have more success with people in his life immediately and that will translate into better behavior all the way around.